You may begin taking your class any time at your convenience! Use the easy to follow directions to proceed smoothly through the class. You may also exit a course at any time and continue it later where you left off. Does my enrollment expire after a certain period of time? You will be able to start the online course at any time during the next 15 days and you will have 3 months to end the course. More time have to be approve by the director under specials consideration and a fee may apply. You can check your progress throughout your courses! You control the order in which you access the lessons and the content. Some gateway control the passing from one lesson to another. You choose whether or not you need additional explanations or examples. A glossary is provided within each course for your use. You can receive immediate feedback at the Module level through in-line questions with explanations. Quiz reviews provide delayed feedback at the Lesson level. You must complete all Modules and Lessons before you can access the Final Examination. Upon completion of all Modules and Lessons for each course, you will have to send copy of your driver's license , passport or fill out the Student Affidavit and also must affirm via electronic signature that you are performing independently. How do I obtain CE credit for completing the course? LNI school will provide you with a certificate for your files, and send a confirmation of course completion to the Board. What is your refund policy for online products? We encourage our students to fill out a Evaluation Form upon completion of each course. Your course evaluations and email feedback is reviewed and considered as we continually improve our site and course offerings. Courses are self-contained – but some assignments need to go outside the course for additional information in order to successfully complete the class! Course levels are for adult with high school completed - These courses build beyond the basic by introducing new material. Topics emphasize mastery and topic updates. You will need a reliable connection to the Internet with a minimum speed of 35k to 40k. This is well within the range of most computers with a 56k modem. You will also need to have Internet Browser Software installed on your computer. We recommend using Microsoft Internet Explorer, or Netscape Navigator, versions 4.0 or newer. Some courses require that you have Macromedia Flash and Adobe Acrobat Reader. This software is installed on most computers. 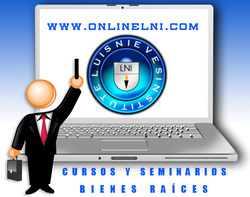 © Copyright on all computer-based and print- based courses held by: Luis Nieves. Courses and Seminars and our students have the right to use and administer the course content and materials. Course content is updated regularly and provided to our students in a timely manner. © 2015 LNI Courses and Seminars. All Rights Reserved.